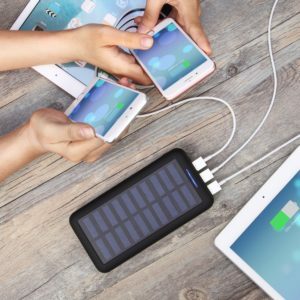 The PLOCHY solar power bank currently sits in our number 2 spot for our top 10 best portable solar chargers. It holds a 4.7 rating on Amazon.com, as well as the Amazon's Choice badge. But is it really as good as Amazon and PLOCHY claim? The PLOCHY solar power bank is a combination of performance and reliability. The charger itself weighs just barely over one pound, making it light. And with a dimension of 3.35 x 6.54 x 0.83 inches, it is super portable. Roughly the same size and shape of a smartphone. It can easily fit in your pocket or backpack. This small packaging is pretty much the only small thing about it. The unit is packed with a 24000mAh Lithium battery and supports both electric and, of course, solar charging. In addition, there are 3 USB ports available for use. Meaning that you can charge up to three devices at the same time without any compromise in speed or performance. Swinging back to the electric charging capabilities, the charger features a micro-USB port as well as a Lightning USB port. So whatever you own, you can use to charge this guy. The PLOCHY solar power bank also supports quick charging technology, which can detect your devices power needs to deliver the fastest charging speed possible. The device has been tested many times by multiple groups of people and has been found to have a crazy charging capability. For example, it has the capacity to charge the Galaxy S7 up to 6 times and an iPad up to 2.2 times. As for the charging ports themselves, the three USB ports have a set limit of 5V/2.1A. A full recharge of the power bank from a wall charger would take about 11 hours. The outer casing is shockproof, waterproof and dustproof. So you can feel secure when bringing it out on hiking, camping, or other activities. The solar panel included in the solar power bank has a conversion rate of 5V/200mAh 1W. Meaning that it would take much longer to charge the power bank by using the fun rather than plugging it into a wall. Almost double the time. The company has stated that the solar charging feature is more for emergencies, rather than relying on it for its sole power source. Other features that the PLOCHY solar power bank includes are LEDs indicating the power level of the bank. There are 4 lights that indicate different levels. Flashing red light means that the energy is between 0 and 40%. A flashing blue light means the energy is between 40 and 80%. The flashing white light shows that the energy level is between 80 and 100%. Lastly, when the white light is no longer flashing, it means that the power bank is completely full.To show that there is no device connected to the power bank, there should be no light at all. This makes it simple and easy to determine how much life is left in your power bank before you set off on your journey. The PLOCHY Solar Power Bank is currently the #2 best seller in the Solar Chargers sub-category on Amazon, and #8 best seller in the Chargers and Power Adapters sub-category, with an 85% approval rating. So people really seem to be enjoying this product. Unfortunately, there is not much to be found about the company PLOCHY. The information found shows that they have not been selling on Amazon.com for very long, starting in 2017. However, they have made huge headway in the little time that they have been selling. They are now a Top 10,000 seller, ranked 8,810th overall as of January 3rd. This was an improvement from their 14,704th position a month before. The company as a whole has a 98% positive rating on Amazon, over the last 12 months. They are one to show that age doesn't mean quality. The PLOCHY solar power bank has a massive battery capacity of 24,000mAh. Meaning that the charging capabilities are incredible for such a small design. Speaking about small, this solar charger is roughly the same size as a smartphone, but a bit heavier. However, barely over 1 pound is not very heavy. So this thing is highly portable, being able to fit easily in your pocket. It also features 3 USB charging ports, which each max out at 5V/2.1A. This means that you can charge up to three devices without having to sacrifice the power output to either of them. The outer casing is all sorts of proof. Waterproof. Shockproof. Dustproof. It can take quite a beating. The charging time for the power bank is about 11 hours from empty. Though that is from a 2.1A wall charger. You can also charge it using either a micro-USB or Lightning USB cords. The power bank also supports quick charging. Meaning that your device will charge just as fast as if it were plugged into the wall. Also comes with a 24 month warranty. Solar panel is rather inefficient, having a conversion rate of 5V/200mAh 1W. It would take 24 hours to fully charge the bank. And that is in ideal solar conditions. The company has actually stated that the solar capabilities are meant more for emergencies, rather than it's sole power source. It is also very expensive. The original price is set at $99.99. However, right now there is a deal going on that brings it all the way down to $39.99. While the PLOCHY solar power bank is powerful, reliable, and durable, it is not the best solar charger. While the solar panels have a decent conversion rate of 5V/200mAh 1W, the charging by only using sun light is rather unreliable. This is because it does not perform well when there is not direct access to sunlight. However, the solar capabilities are perfect if you need them for an emergency. That being said, the solar power bank does have a lot of great tech and features behind it that can make up for the inefficient solar panels. While there is a lot of power behind the PLOCHY solar power bank, it does not make for a great solar charger. So if you are looking for a great and reliable solar charger, this probably is not the one for you. However, if you are someone who is looking for a powerful power bank with a solar alternative, this is perfect. Right now, there is a deal going on for this power bank on Amazon has brought the price down from $99.99 all the way to $39.99. So if this sounds like the right power bank for you, you'd better jump on it before the deal is over. Here are some top questions that I found for people seriously considering buying the PLOCHY Solar Power Bank. Can you charge the power bank while it is charging another device? No, the charging of a device and the recharging of the power bank would have to be separate for safety considerations. How long will it take to charge the power bank via the solar panel? Roughly 24 hours, with ideal sunlight conditions. Since the power bank features a huge battery, and sunlight conditions are never constant, PLOCHY does not recommend solely using solar power for the power bank. Can this charge any other devices other than cellphones and tablets? It can charge anything that uses a USB to charge.